Alachua County Farm Bureau board members presented a $10,000 check to Santa Fe College President Jackson Sasser. Standing, left to right, are Bill Brown, Alan Hitchcock, Brittany H. Lee, Agency Manager Craig Mikell, President Winston Rushing, President Sasser, Bill Deas, Richard Feagle, Dean Cheshire and Jim Emerson. 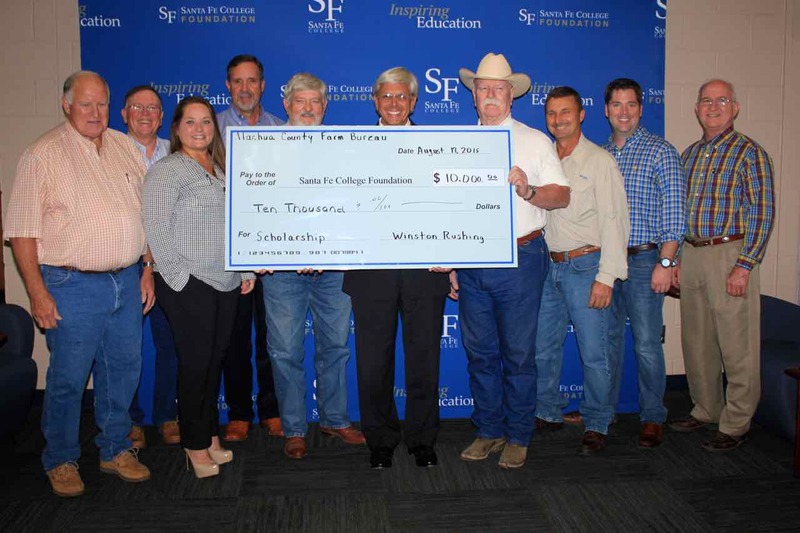 At its August meeting, the Alachua County Farm Bureau Board of Directors traveled to Santa Fe College to present a check for $10,000 to fund scholarships for students pursuing degrees in agricultural or agriculture-related fields. The county Farm Bureau has now donated $40,000 toward a goal of $50,000 by 2016. Approximately 22 million people in the U.S. work in agriculture and related fields. Agricultural careers include the fields of agribusiness management, agricultural and natural resource communications, building construction management, agriscience, resource development and management, parks, recreation and tourism resources, packaging, horticulture, forestry, food science and fisheries and wildlife. Santa Fe College President Dr. Jackson Sasser accepted the donation on behalf of the college’s endowment fund, noting with pride that this year, Santa Fe College ranks first among peer institutions in the United States. In March, the college was awarded the 2015 Aspen Prize for Community College Excellence, the nation’s preeminent recognition of high achievement and performance in America’s community colleges. Alachua County Farm Bureau has a longstanding tradition of supporting youths and education. Each year it provides direct scholarships to active Farm Bureau members and their children. It continues to offer those scholarships in addition to supporting the scholarship program at Santa Fe. Boasting the largest membership of any county Farm Bureau in Florida, ACFB is dedicated to advocating for farmers, ranchers and rural landowners and improving the quality of rural life. It is affiliated with the Gainesville-based Florida Farm Bureau Federation.